This article I will show you how you can pass multiple parameters in querystring or url in asp.net using c#.net. 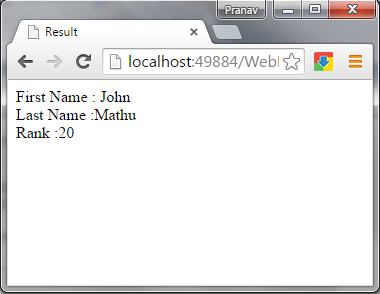 So for this article first we will create a new asp.net application and add a button control. Now generate the button click event and add the below code. Now add the .cs code. In above code I have passed the request querystring value in url. Now on other page add the add the below code to retrieve the value passed in url. In above code I have checked the url value and display into the page. Now we have done run the application to check the output. Now click on button. As we click on button break pint will hit and we will get the value. Now press F5 to see the final output.